I have heard a lot of hype about this fight, lots of hoopla, people saying stuff about the camps, psychology, trainers, drug testing, networks and so on. I have not seen much about the actual skills of the boxer when pitted against each other. What I have seen is how Mayweather will win and how faded Manny Pacquiao is. 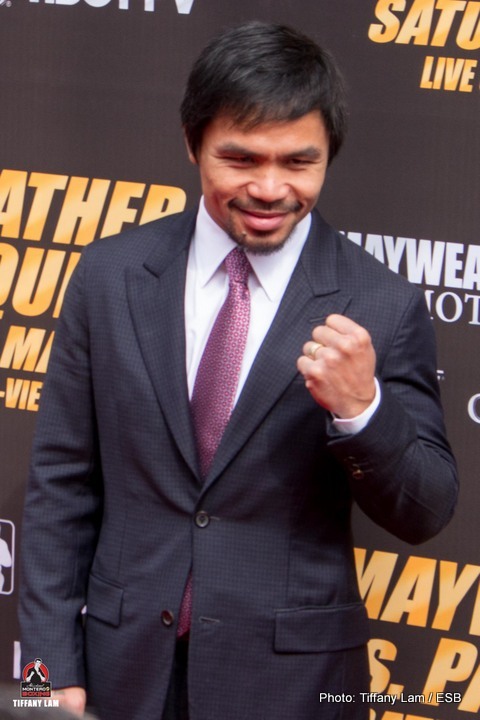 Well, I think Pacquiao will win and nobody has really said much about the details of how Pacquiao will win, which is silly because he has a great chance, this is my opinion. Pacman’s offence, as usual, is the key to him winning specifically his punch output combined with his accuracy and most importantly his footwork; Floyd has never fought anyone with the combined output and accuracy. Manny has a high output and because of the speed which he can deliver punches he is very accurate for a person that throws that many punches. Now to his footwork, I really don’t care if he has lost a step Pacquiao is the quickest a foot boxer on the planet, what sets him apart from other Floyd foes, and almost every other boxer that has lived, is the sustained foot movement, he is accustomed to chasing people and almost everybody runs from him, if they don’t run they usually get the beating of their life, the footwork, not just the punches are why people call him a buzz saw. He has that little slide step to the left where he doubles or triples up on the jab to distract you, then throws a left hand, that move alone is going to give Floyd fits, and Manny has more offensive tricks than anyone else that Floyd has ever fought. Then there is the fact that Manny is about the “cleanest” fighter in boxing, I can’t recall anytime Manny getting a point deduction and he never uses any intentionally borderline tactics, there has to be one, every boxer has gone there I just cannot recall anytime. Not that I think that being a “clean” boxer is an advantage, I am a fan of many boxers with “questionable tactics” and many of the greats had them, the Ali backhanded jab was a nasty one that I only saw one ref call him on, I also like Hopkins and his very creative use of the Queensbury rules as guidelines not absolutes. But the fact is that the lack of dirty tactics from Manny is going to highlight the questionable tactics that Floyd uses multiple times per round, holding, the forearm to the face, pushing down on the back of the head with the forearm, all of which he is well known to use and you better believe that Freddie will be extremely vocal to the ref, being a 6 time trainer of the year may pull a little more weight than some of Floyds other opponents. Combine these reasons and Floyd chances, in my eyes, start getting pretty slim. To me this fight is, Floyd needs to knockout Manny to win, but Manny has better chance for the knockout and the decision. The key for Manny is to keep throwing punches after he misses the first one, two or three; this is not far from his normal strategy so it is not asking him to do something out of the ordinary. For Floyd to win I think he needs to something that he normally doesn’t do, he will not be able to potshot Manny, he will have to fight more like he did at much smaller classes, on his toes, jabbing, throwing combos, this is not the Floyd of today, the Floyd of today dismantles fighters with potshots, frustrating defense, and questionable tactics, which I do not think will work against Manny. In my opinion we will see a Mayweather in a fight that he has not been in, a fight that he will have to deal with Manny’s offence that he cannot simply neutralize with one or two moves, the norm is that fighters have to deal with the puzzle of Floyd not Floyd dealing with the puzzle of his opponent. For how deep Floyd’s defense is, with move upon move and option upon option, I think Manny’s offence will have all the answers to the riddle of Floyd’s defense. Manny will control the action with his footwork and pepper Mayweather all night long, occasionally landing a hard shot but mostly settling for slapping Floyd around for 12 rounds, Mayweather will be not an easy guy to get out of there, that punch that Mosley landed was a haymaker from a guy with power to knockout Margarita, Chop Chop hit him hard enough to give him the dead man stare too, but he survived both of those. What I am hoping for more than anything is, two warriors to go out there and leave everything in ring. We will see two fighters with skill sets that are supreme in their sports. I think that we will see Mayweather having to fight a fight he is not comfortable fighting and he will get hit more than he ever has, it is when the desperation sets in to keep that zero is when we will see a great fight breakout and Floyd get pushed harder than he ever has, which is unfamiliar territory for Mayweather not Manny. Manny by wide 12 round UD in an entertaining bout that lives up to the hype!